Do you have an inner summer child? I do! When I woke up this morning...after I used my Flonase for allergies and Prilosec for heartburn....I thought about what it was like on a summer morning when I was a child. It was so exciting to get the day started.I would jump out of bed and pull on a pair of shorts or my favorite skort. You do remember skorts don't you? Those cute litttle short and skirt combinations. I loved them. I would then pull on my summer Keds. My dad always took us down to the local shoe store to get us a new pair of Keds at the start of the summer. I always chose red. Well, guess what I still wear Keds. 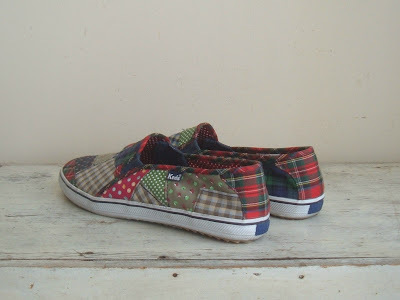 This year I have a great pair of patch madras Keds. You do remember patch madras don't you? How cool are these? I can definitely feel my summer kid coming out. It was then time to head downstairs for breakfast. I loved getting to choose which cereal I wanted. Lots of choices full of sugary goodness. Rice Krispies were my favorite. Loved the snap, crackle, and pop. Guess what I loved a fresh peach cut up on my cereal and I still do. Today I had Kashi Heart to Heart, but still brought out my summer child. After breakfast we were allowed to watch Captain Kangaroo on some days. 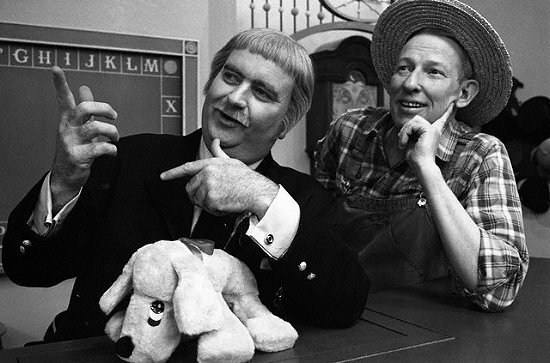 I loved Captain Kangaroo and Mr. Greenjeans. I don't watch much TV anymore, but I worked the crossword. A fun way to start the day. Then it was time to hit the great outdoors. I didn't get to play today, but it was still cool enough this morning that I rolled down my car windows and let the wind blow my hair while I ran some errands. Brought back lots of memories of car rides before we had air conditioning. You remember those days don't you? My brother, sister and I would be crammed into the backseat sweating and fighting. It was great!! So, I don't know about you, But I am enjoying my summer inner child. Before you know it, I will be at the local Woolworths eating Tootsie Rolls and drinking cherry Coke. I have wonderful memories of being a kid, too. Did you get the summer Weekly Reader in the mail? I've been searching to see if I could find any of those. What fun to get mail! And remember riding your bike all day...and never getting tired! 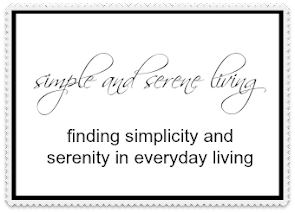 Stop by when you can...I'm having a giveaway! You've brought back so many memories! I wore skorts, for sure, and loved Captain Kangaroo and the summer seemed long and endless, in the most wonderful way. Thanks for this post! I loved Skorts and dr. scholl's exercise sandals when they were first available at the drug store... Mr. Greenjeans was my favorite part of the show ! Hugs from your big sister. I remember skorts. I think corn pops were my favorite, and yes, I watched Captain Kangaroo. Nice stroll down memory lane. I'll never lose my inner child. Such a fun post Laura. I remember crafts and fun at the local park every day....playing under the hose.....and hide n seek in the dark, after catching fireflies. Happy happy 4th. Me too! And now I keep the flonase, zyrtec, patanol(for allergy eyes) on hand. Of course the prilosec I take every day, too! But summer is my favorite time of year! That's WHY I am passing you the Sunshine Award!!! You always brighten my day!!! You are such a positive, kind person! Please read my latest post about the Sunshine Award! Since I grew up in Brazil, I am not familiar with some things you mentioned. I loved that you let the window down, lol! I will do that next sunny morning! YES, of course I remember cars without air conditioning! Fighting with my brother in the back seat... those were the days!!! Hugs! Hey, you're pretty much the same child as you were, aren't you! I sure do remember the skorts, I loved them too! I have to think about how to bring a bit more of my child nature to the present. I need this! Great memories! I was in my home town for a funeral July 3, and had a chance to reminisce about childhood memories with my cousins. :D Such a cute post, and i love your Keds! They are adorable.